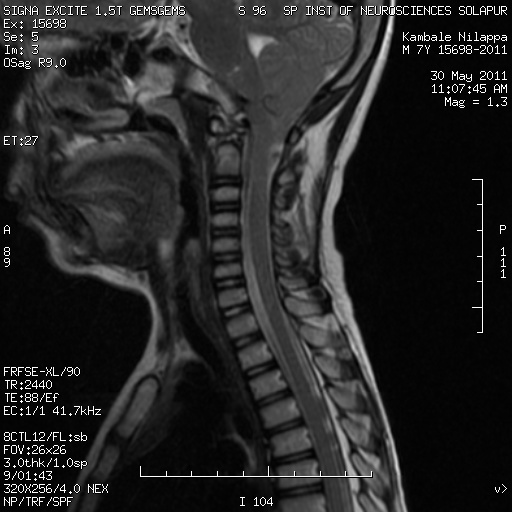 MRI Cervical spine sag T2 w image shows Pointed peg like low lying cerebellar tonsils by ~7mm. Obliteration of pre pontine cistern. No associated syrinx or signal abnormality in cord. No associated anomalies involving base of skull. Syn: Chiari type 1, Cerebellar tonsil Ectopia. Definition: An abnormal caudal protrusion of the cerebellar tonsils across foramen magnum. First described Hans von Chiari (1891). There are total four types of Chiari malformations are described in the literature, type I, II, III, and IV. Rest of the malformations are quite distinct imaging wise from type I.
MRI, mid sagittal T2 section at the level of CV junction the best. 1. Low lying pointed and peg like cerebellar tonsils below the Opisthion - Basion line by more than 5mm for adult and 6mm for children. 2. The tonsillar descend should be primary and not secondary to or as a sequel of raised intracranial pressure by intra cranial space occupying lesion, hematoma or cerebral edema which is a seperate entity labelled as Acquired Chiari Malformation. Pattern of sulci on cerebellar tonsills which are normally horizontal, gets vertical instead of horizontal. Effacement or obliteration of Cisterna magna and prepontine cistern. There may be an associated focal Cord odema at CV junction or syrinx in cervico dorsal cord. Syrinx results from altered CSF dynamics, the exaggerated pulsatile systolic wave in the spinal subarachnoid space drives the CSF through anatomically continuous perivascular and interstitial spaces into the central canal of the spinal cord. Obstructive hydrocephalus is also known in severe cases. Severity or degree of tonsillar ectopia measured and expressed in millimeters the tonsillar tip extends below the opisthion - basion line. Less than 5 mm does not exclude Chiari malformation, if other associated finding are present like syrinx, cervicomedullary kinking, elongation of the fourth ventricle, a pointed or peglike appearance of the tonsils present with patient clinically symptomatic. For children the descend or distance up to 3 mm is normal. For children this cut off criteria for diagnosis of Ch I is 6 mm. Ch I is not directly associated with other congenital brain malformations. However, bony CV junction anomalies are common in patients with Chiari I malformation like Platybasia, basilar invagination, Scoliosis , Retroflexed odontoid process, fusion, Atlantooccipital assimilation. Acquired tonsillar herniation: Raised ICP secondary to intracranial space occupying lesion like tumour, hematoma, cerebral odema. Micro crania or Cranio synostosis. Pseudo-Chiari Malformation: an associated with sagging brain stem secondary to spontaneous intracranial hypotension and post lumbar puncture procedure.